ENGLAND HEAD COACH Eddie Jones says he is “very sorry” after footage emerged of him referring to Ireland as “scummy Irish” during a speaking engagement last July. Ireland denied England the Grand Slam on the final game of the 2017 Six Nations, when they secured a 13-9 victory at the Aviva Stadium. Four months later, Jones gave a talk on leadership at a Fuso conference and said: “We’ve played 23 tests and have only lost one test to the scummy Irish. I’m still dirty about that game. But we will get that back! Ireland face England at Twickenham with the Grand Slam on the line this weekend, and the video of Jones’s remarks began circulating on social media after Second Captains tweeted the clip earlier today. “I apologise unreservedly for any offence caused – no excuses and I shouldn’t have said what I did. I’m very sorry,” Jones said in a statement released by the RFU. Email “England coach Eddie Jones apologises for 'scummy Irish' comment”. 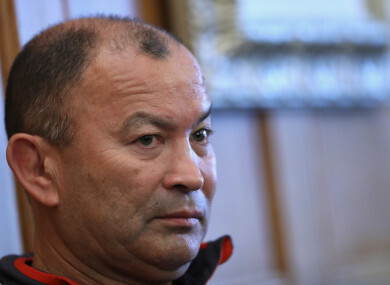 Feedback on “England coach Eddie Jones apologises for 'scummy Irish' comment”.